Ships carrying crude oil and petroleum products are limited by size restrictions imposed by several of the main thoroughfares of maritime navigation: the Panama Canal, the Suez Canal, and the Strait of Malacca. These size restrictions provide another way to classify the large tankers that carry most of global crude oil and petroleum product trade. The Panama Canal, an important route connecting the Pacific Ocean to the Caribbean Sea and the Atlantic Ocean, currently has a limited role in global crude and petroleum product transport. The canal’s current size restrictions means smaller vessels, with capacities of approximately 400,000-550,000 barrels of light sweet crude oil, are the only ships that can safely pass through the canal. 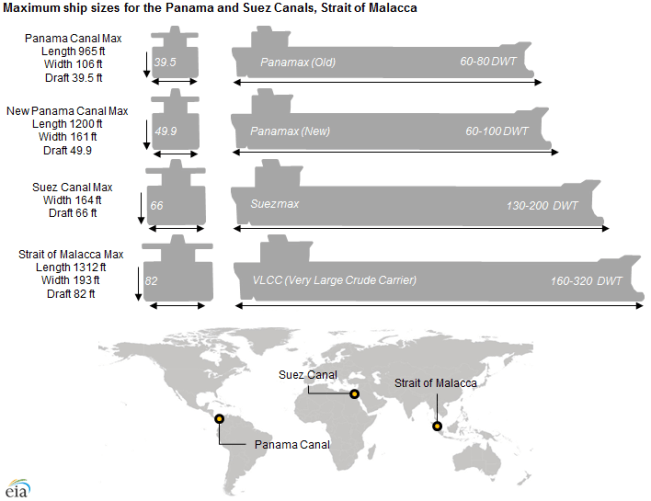 These ships are referred to as Panamax tankers, and their smaller cargos lead to a higher per-barrel cost. However, the Panama Canal is undergoing an expansion that will allow for the passage of larger vessels with capacities of approximately 400,000-680,000 barrels of crude oil. These larger tankers have the potential to increase crude and petroleum product transport through the canal. Larger vessels or vessels that are slightly over the draft limit can use the Trans Panama Pipeline, which runs parallel to the canal and has both the loading and unloading points for a complete transfer, but doing so adds to shipment costs. In addition to oil transit, the expansion of the Panama Canal, now slated for late 2015, will be able to provide passage for up to 80% of global shipping of liquefied natural gas (LNG). It currently allows passage of only a small percentage of LNG shipping and only shipping by the smallest of LNG tankers. The Suez Canal in Egypt is a major transit route from the Persian Gulf to the Mediterranean and beyond that to North America. The Suez Canal saves an estimated 6,000 miles of travel around the Cape of Good Hope at the southernmost point of Africa. As the sizes of vessels in the global fleet have increased, the canal was deepened and widened. The current Suezmax limitation on vessels passing through the Suez is a draft of 66 feet and a width of 164 feet. A ship of this size has a deadweight tonnage of approximately 900,000 barrels to 1.3 million barrels. However, most vessels do not transit the canal fully laden; vessels instead unload into the Suez-Mediterranean (Sumed) Pipeline, which runs parallel to the canal, prior to transit and reload once having passed through the canal. The Strait of Malacca, located between Indonesia, Malaysia, and Singapore, links the Indian Ocean to the South China Sea and Pacific Ocean. The Strait of Malacca is the shortest sea route between Persian Gulf suppliers and the markets of Asia. However, the size of vessels that can safely navigate the strait (Malaccamax) is limited to a draft of 82 feet, along with length and width restrictions. This is approximately equal to a vessel classified as a Very Large Crude Carrier (VLCC), with a capacity of 1.9-2.2 million barrels of crude oil. Larger vessels, such as Ultra-Large Crude Carriers (ULCC), must use alternative navigation routes with deeper channels, adding time and cost to the voyage.